Whether we want it or not, we are getting at least one more movie featuring Johnny Depp as Captain Jack Sparrow, and now we have the trailer to prove it. 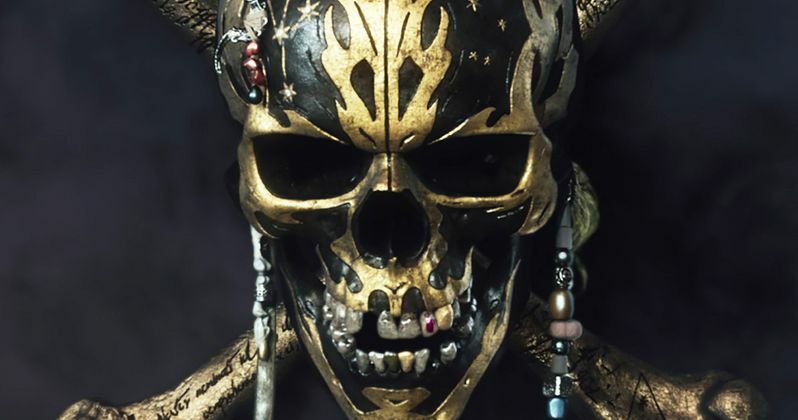 Yes, Disney has released the first trailer for the fifth installment of the Pirates of the Caribbean franchise, Pirates of the Caribbean: Dead Men Tell No Tales. While many moviegoers may not have a lot of faith that the movie will be good, they would most certainly love it to be. The Disney's Pirates of the Caribbean Facebook page announced that the trailer would be debuting during the season finale of Fear the Walking Dead on AMC. The announcement included a brief teaser for Pirates of the Caribbean: Dead Men Tell No Tales, but didn't include any actual footage. It did give us our first look at the new logo for the movie, but now the trailer is here, giving us our first look at Captain Jack and a whole lot of swashbuckling goodness. Or badness, depending on how you feel about the franchise at this point. Pirates of the Caribbean: Dead Men Tell No Tales will follow a down-on-his-luck Captain Jack Sparrow once again in a tough spot when he encounters deadly ghost pirates led by his old nemesis, the terrifying Captain Salazar, who is being played by Javier Bardem. The ghosts and Salazar have escaped from the Devil's Triangle, determined to kill every pirate at sea, including Jack. Sparrow's only hope of survival lies in seeking out the legendary Trident of Poseidon, a powerful artifact that will give its possessor total control over the seas. The first Pirates movie, Pirates of the Caribbean: Curse of the Black Pearl was a big success, but perhaps more importantly, was incredibly well-received movie by fans and critics. It also earned Johnny Depp an Oscar nomination for his portrayal of Captain Jack Sparrow. The franchise has steeply declined in terms of quality, but the movies have continued to bring in big bucks at the box office. To date, the franchise has made $3.7 billion worldwide, with the most recent installment, Pirates of the Caribbean: On Stranger Tides, managing to gross more than $1 billion. So, regardless of the quality, it makes sense that Disney would want to keep the franchise going. Returning this time around are several fan favorites from the Pirates of the Caribbean franchise, such as Geoffrey Rush as Barbossa, Orlando Bloom as Will Turner, Kevin McNally as Joshamee Gibbs and Stephen Graham as Scrum. The supporting cast also includes newcomers Kaya Scodelario, Brenton Thwaites and Golshifteh Farahani, in addition to the aforementioned Javier Bardem. Sir Paul McCartney also has a super secret role in the movie. Pirates of the Caribbean: Dead Men Tell No Tales is being directed by Joachim Rønning and Espen Sandberg and is set for release on May 26, 2017. Be sure to check out the first trailer for yourself below.